On Tuesday, July 28, 1998, Drs. Richard Al�, UHD's Executive Director for Grants and Contracts at the University of Houston-Downtown, and Richard Tapia, Associate Director of Minority Affairs at Rice University, were interviewed together at KUHT Studios. The interview was conducted by Doris Childers, Reporter for KUHT's "Weeknight Edition". KUHT (Channel 8) aired the interview on Wednesday, July 29, 1998 at 5:30 PM and 10:30 PM. The interview revolved around minority education. Drs. Al� and Tapia discussed issues surrounding minority education and their joint efforts to counter the low numbers of minorities in higher education. One such example was their collaborative efforts in organizing and conducting the recent joint conference (ADMI '98 and SC-COSMIC) held at Rice University on June 25-28, 1998. The South Central - Computational Science at Minority Institutions Consortium (SC-CoSMIC) workshop entitled "Steering Minority Education for the 21st Century" was held on June 25, 1998. 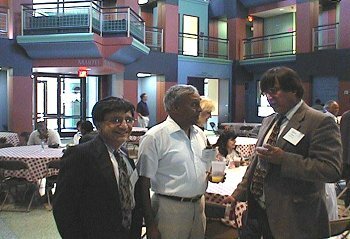 Associated with this meeting, the Association of Departments of Computer and Information Science and Engineering at Minority Institutions (ADMI) held it's annual meeting from June 26-27, 1998. In keeping with the Assessment theme, ADMI's theme for this year's annual workshop was "Assessment and Vision." This joint conference took place in Houston, TX and was hosted by CCSDS and The Center for Research on Parallel Computation (CRPC) at Rice University. Students from SC-CoSMIC institutions (Rice University and UHD) took an active part in shaping the SC-CoSMIC conference, participating in panel discussions, researching the institutions and writing the final document, which is to be sent to key government officials and others. Students from ADMI institutions (Rice Univ., UHD, Univ. of Puerto Rico-Mayaguez, Hampton Univ., and Howard Univ.) presented research papers, participated in panel discussions and graduate studies workshops. High school students and teachers from CCSDS's Houston PREP Program participated in the ADMI "Special High School Program." A web page with more details on both meetings is accessible at http://www.crpc.rice.edu/CRPC/SC-COSMIC-ADMI98. Presentations from UHD included the following: Richard Al�, CCSDS Executive Director, presented "Improving Research and Undergraduate Education in Mathematics and Computer Science at UHD" within the ADMI Programs and Success Session; Jesus Azcarraga presented "Relevance Filtering in Distributed Simulation Systems" within the ADMI Simulations Session; Rene Garcia presented within the SC-CoSMIC "Strength and Weaknesses of Minority and Majority Institutions" Panel Session. Richard A. Al�, Joint Conference General Chair, secured funding for SC-CoSMIC and ADMI from the National Science Foundation and US Army Research Laboratory to bring Minority Institutions to the Assessment Discussions and to produce a report on the status of Minority Institutions. Dr. Al� also secured funding from the US Army Research Office to allow Houston PREP participants to attend ADMI. (In picture below, individuals are listed left to right) During the ADMI Assessment and Vision Symposium, Judge Dickson, Director of Education Initiatives and University Relations, IBM Corporate Headquarters; Leonel Castillo, Education Coordinator, City of Houston; Mark Palmer, University of Oklahoma, member of the Kiowa Tribe of Oklahoma; and Michael Carroll, Dean of Engineering, Rice University, spoke about the impact of anti-affirmative action legislation on the technical workforce in the 21st century. Pictured below at the ADMI98 Conference are (from left to right): Orville Bignall, ADSRC Executive Director; Ratan Guha, Computer Science Chair at the Univ. of Central Florida; Deidre Williams, CS Faculty Member at Florida A&M Univ. ; Andre de Korvin, UHD CS Faculty Member; Kathy El-Messidi, Associate Director for External Relations, CRPC, Rice Univ. ; Ali Berrached, UHD CS Faculty Member; Richard Al�, Vice President for Programs, ADMI; and Mohsen Beheshti; UHD CS Faculty Member. A grant in the amount of $19,000 was received from ARL to assist in the support of the Joint Conference - SC-CoSMIC 98 and ADMI 98. The ARL grant provided funds for participant support and to generate a report. This report will be based on evaluations (completed by the conference participants) and input by SC-CoSMIC leaders and professional evaluators. The report will then be disseminated to key academic and governmental decision-makers for their review and comments. Gathered during a breakout session at the SC-CoSMIC Conference are (from left to right): Dr. Richard Al�, SC-CoSMIC President; Dr. Jagdish Chandra, Deputy Director of Information Science and Technology Directorate, U.S. Army Research Laboratory; and Dr. Richard Tapia, Director of Minority Education, Rice University. Dr. Richard Al� attended the Coalition of Academic Supercomputing Centers (CASC) Meeting held at Duncan Hall, Rice University on April 6 - 8, 1998. On April 7, Dr. Al� presented "Improving Research and Undergraduate Education in Mathematics and Computer Science at UHD."